*Please note that the links on this page will take you to the 13.3 inch Sony SVF13N13CXB page on Amazon.com as the 11 inch model is no longer available for sale- removed by Sony from the market. 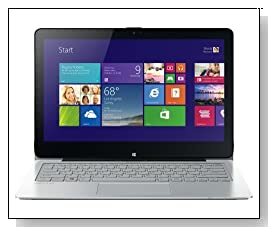 * Silver Sony Vaio Flip SVF11N13CXS is an 11.6 inch innovative, versatile, light, compact and convertible touchscreen PC laptop and a tablet in one: It goes from notebook mode to laptop mode to viewer mode with just a flip. It is packed with contemporary features such as a large and responsive touchpad, a backlit keyboard, great touch screen function with instant access to applications and files on tablet mode or you can simply reverse the display to watch videos or show your screen to the people on the other side of the table and more.. It is not just about the looks and functionality with the Sony VAIO Flip either, as it is quite a bit of a performer too with its Haswell Intel Pentium N3520 (2MB) quad core processor at 2.16GHz speed, 4GB DDR3L SDRAM at 1366 MHz for smooth multitasking and the 128GB Solid State Drive. It comes with the 64-bit version of the latest Windows 8.1 operating system with its customisable tiles and additional features pre-installed. Rapid Wake Technology by Sony allows you to resume the system instantly- in a couple of seconds when it is in sleep mode and you don’t have to turn it off at all and all your data stay safe. Pentium N3520 is a budget level 4th generation processor that is well capable of performing day-to-day tasks. Strongest thing here is the reliable and durable 128GB capacity SSD technology obviously, which makes sure system boots up much faster and you get an improved performance level overall. 11.6 inch Full HD LED backlit Triluminos Display capacitive touchscreen with 1920 x 1080 pixels maximum screen resolution and Intel HD 4000 graphics.. Neither the graphics card nor the system processor is suitable for the latest 3 dimensional games but you can definitely play some of the current day games at lower settings. 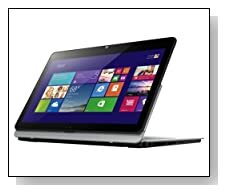 Full HD that supports 1080p resolution offers a much better- sharper and clearer viewing and touchscreen experience overall than the standard 720p you’ll find on most windows laptops. You’ll also be able to watch movies and use the touch function of the display more comfortably on the stand mode. Taking still photos or chatting live on Skype even in darker rooms is nice and easy with the good quality front HD webcam with the Exmor R sensor. The webcam with the Sony Exmor RS at the rear is an 8 megapixel one and offers even better- sharper and brighter picture quality and an integrated monaural microphone Audio System made of Intel’s HD Audio and Clear Audio+ mode gives you the unique Sony sound experience of loud and clear sound with little distortion and dynamic bass. Being such a slim and light model with 2.82lbs weight and 0.75 inch thickness that is very easy to carry around when you’re out and about, you won’t get a CD/DVD drive on the Sony VAIO Flip but an HDMI port, Headphone Output and Microphone Input, a Secure Digital Slot, 802.11b/g/n wireless, Bluetooth 4.0 and 2 USB 3.0 ports. You’ll also get a backlit QWERTY keyboard with 82 keys with 1.35mm stroke. It comes with a Lithium Polymer battery that should give you around 5 hours of battery life in normal daily usage. Adobe Photoshop Elements 12, Kaspersky Internet Security (1 month trial), Microsoft Office trial, ArtRage Studio, Vaio Care and PlayMemories Home are the software that comes pre-installed on the Sony Vaio Flip. Conclusion: Sony Vaio Flip SVF11N13CXS is a modern hybrid convertible with tablet, laptop and viewer modes and many modern day features such as a backlit keyboard, a Full HD 11.6 inch screen with IPS feature, two high megapixel webcams, superior sound quality, good amount of memory, an entry level Intel Haswell processor and more importantly a super fast 128GB Solid State Drive that shall change the whole experience for you: The computer boots up, wakes up from sleep and performs everything much faster than if it were only with a regular SATA hard drive. This is not a super power gaming machine for those most advanced games at higher settings but you’ll be fine for almost all the daily tasks including the lighter games. Sony Vaio Flip is more about the modern design, Full HD display, portability and convertibility with other current features than what an expensive powerful desktop computer would give you.